Where are all the teachers of color in Minneapolis and St. Paul schools? 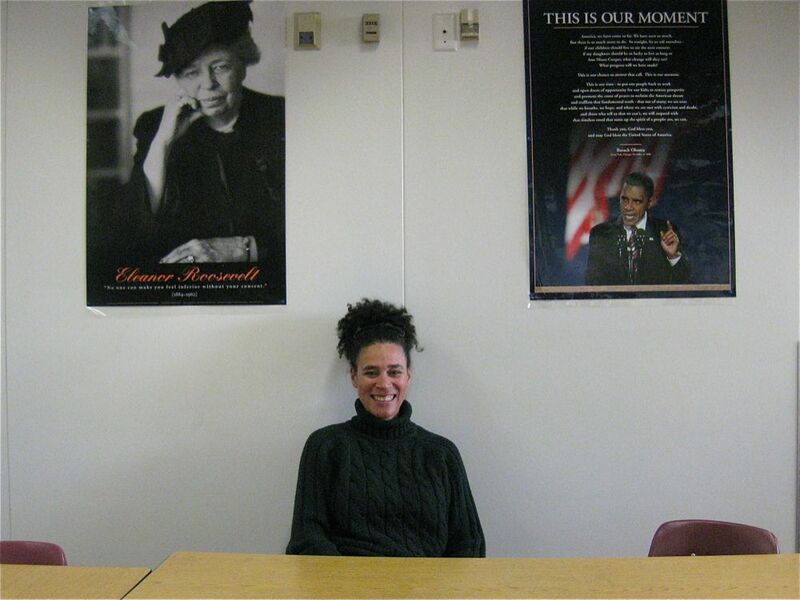 Central High teacher Karen Palmen sits between her heroine and her hero. It isn’t because she’s black that St. Paul Central High English teacher Karen Palmen is an effective teacher for her African American students. She can tell her color matters to them, though. “There’s a sense of ease. There’s an expectation that, ‘Oh, okay. She’ll understand me.’ You can feel it. You can see it in their eyes,” she said. This is part one in a two-part series exploring why there are so few teachers of color in Twin Cities schools. See part two: Affirmative action for teachers: Too controversial for Minnesota nice? Palmen’s experience growing up was likely more similar to that of her white students than to many of her African American students. She was raised in a white family. Last year, FAIR school fifth grader Mikaela Bradley had her first African American teacher. Her mother said she often returned home with stories about Ms. Hudson’s hair, which is similar in texture and color to Mikaela’s hair. “When she has a teacher of color, she gets to see herself fully embodied, which is a rarity,” she said. Many Twin Cities teachers grew up in Minnesota schools that were much whiter than they are now. *St. Paul and Minneapolis may have used different measures to find these numbers. The numbers may not be comparable. In the last 20 years, the Twin Cities student body became less white. In St. Paul, the teaching body is diversifying much more slowly than the student body. Today, 15 percent are not white. Palmen is one of few non-white teachers her students have had. In St. Paul 15 percent of teachers are not white, compared to 76 percent of students. In Minneapolis, 17 percent of teachers are not white, compared to 65 percent of students. Minneapolis and St. Paul district human resources officials say they want more teachers of color, but race doesn’t trump credentials. For now, too few people of color are making it through Minnesota’s education pipeline into the classroom. The ultimate solution would be nothing short of closing the achievement gap. The problem’s roots are embedded in the same web of economic, historical and cultural issues that cause the gap in standardized test scores and graduation rates between white and non-white Minnesota students. A few alternative solutions may be too controversial to gain widespread support. “We’d like to see a bigger pipeline,” he added. Minnesota’s teacher pipeline narrows as early as third grade, when 20 percent fewer students of color met state reading standards last year, compared to white students. To become a teacher, Minnesota students must first make it out of high schools where overall 45 percent of non-white students did not graduate on time. One St. Paul initiative is aimed at students just beginning to contemplate a teaching career. The union-sponsored Future Teachers of St. Paul at Como High connects the diverse student body with teacher mentors and teaching experiences. It’s new last year, though, so it has not had time yet to produce any teachers. In the last decade many families left urban district schools for charters or suburban schools. The newest teachers, including many teachers of color, were laid off. Generational differences and layoffs don’t explain the whole gap, though. Minnesota universities continue to produce proportionally fewer teachers of color than K-12 student demographics would predict. In the past two years, according to the Minnesota Board of Teaching, approximately 13 percent of Minnesota students who took the teacher’s licensure test were not white. Statewide, 26 percent of students were not white. Also disconcerting, many of the teachers of color who took the test didn’t pass. Teachers must pass basic skills tests in math, reading and writing to get a license. In the last two years, 75 percent of all test takers passed the basic math test. Only 26 percent of African American testers and 45 percent of Hispanic testers passed. The passage rate of Asian and multiracial testers was comparable to white students. That gap is wider than it was before the Minnesota Board of Teaching voted to adopt a more challenging licensure test in 2010. In the ten years before the new test, 92 percent of all math testers passed, compared to 58 percent of African American testers and 70 percent of Hispanic testers. Palmen, who began serving on the Teaching Board after the new test was adopted, said she’s pushing to change the test. She believes the basic skills tests are the biggest barriers to African Americans entering the classroom. Palmen’s ideal would be to replace pen and paper standardized tests with a performance-based assessment. Right now state law requires teachers to pass a basic skills test. Making the tests easier is a tough sell to a board that just made them harder. Executive director Karen Balmer said the board is discussing alternative assessments, but to change the level of difficulty would be to go against a recommendation made by a diverse panel of teachers and other stakeholders. Olson middle school teacher Crystal Ballard moved to the Twin Cities from Detroit, where she passed the Praxis test. She said she doesn’t know if she would have decided to teach here if her test scores hadn’t transferred.